FRGCB - Finnish Retro Game Comparison Blog: TWOFER #15: Finnish Special! For this year's Finnish Independence Day special, I decided to go with another two-fer for a change, even though we just had one not too long ago in the form of Mastertronic's Formula 1 Simulator. Since there aren't all that many old Finnish titles that were released for more than one computer, these two games seemed very fitting for the occasion, even though they're both completely different sorts of games, originally made for two different computers. But I guess it's the setup of C64 vs. Spectrum and vice versa, which makes this a particularly interesting two-for-one comparison article. Stavros Fasoulas' classic shoot'em-up Sanxion was the first Finnish game to receive proper attention from foreign gaming press, and for good reasons. For starters, it was the first game published by Thalamus, a company headed by an ex-Activision PR manager Andrew Wright and Newsfield staff writer Gary Liddon, and received a lot of attention for that alone. The game itself featured many rarely used ideas, some of which were even established here: an adjustable rate autoscroll for a forced-scrolling shoot'em-up and a dual-view screen to show things in a pseudo-3D-like aspect. Of course, the loading music has become a classic on its own accord, but that's a story for another section. Anyway, this game begun Stavros' run of three successful titles for Thalamus before his career was interrupted for his complusory service in the Finnish Defence Forces. At the time of release, Zzap!64 gave Sanxion a whopping 93% rating. History hasn't been too kind on Sanxion, however: currently, the original C64 version has a score of 6.7 from 97 votes at Lemon64, while the Spectrum remix of it from 1989 has a score of 6.3 from 10 votes at World of Spectrum. The unofficial Plus/4 conversion has been voted by 3 visitors at the Plus/4 World website, to settle down to a rating of 6.0. As for Sceptre of Bagdad... Well, not a lot about it has been known so far, but it is one of the rare Finnish-made Spectrum-originated games that were commercially available for a larger audience. To my knowledge, it might well be the only one of its kind. 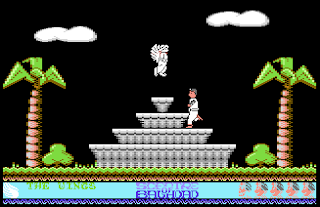 Sceptre of Bagdad follows the tradition of arcade adventures such as Pyjamarama (the game engine of which Bagdad uses) and the Dizzy series, and is a surprisingly well-made example of its genre. Strangely enough, the game experienced some sort of a revival in 1993, when Jonathan Wells programmed a conversion for the C64 to be released by Atlantis. However, since they went bankrupt before Wells got the game ready for release, a new game publishing company called Psytronik got established, primarily to get this game out. Although the C64 was already practically commercially dead at the time, Sceptre of Baghdad (as it became re-titled) served as a reminder, that there's still a lot of talent on the C64 scene. In a roundabout sort of a way, we have to thank Productive Playtime for creating a game worth doing a C64 conversion, the release of which would require the establishment of Psytronik Software. The game received fairly good reviews for a budget title - usually around 7 or 8 out of 10. Currently, the original Spectrum version of Bagdad has a score of 7.77 from 40 votes at World of Spectrum, while the C64 conversion only has 6.8 from 16 votes. Perhaps the game is more natural for the Spectrum environment, but let's go through the comparison and see what's what. SANXION is a forced side-scrolling shoot'em-up with a few twists. The adjustable rate autoscroll that I mentioned earlier means, that you can adjust your speed by moving your ship accordingly, but there is a minimum speed, in which the game will scroll forward automatically. The screen is cut in two sections, the top of which shows you from the side and the bottom of which shows a further-away view from above, letting you see more of the on-coming traffic compared to the sideview screen. Of course, the problem with Sanxion is, as with all the other shoot'em-up games, that even with the variety of attack waves and the different enough bonus rounds, it does get repetitive. On top of that, it has an ending just to loop from the beginning again, so it's basically a traditional score attack style arcade game, only with the few twists already mentioned. However, Sanxion definitely served its purpose in the timeframe, and gave us Finnish nerds something to be proud of on a completely new level. SCEPTRE OF BAGDAD is an archetype of a flip-screen arcade-adventure, and I don't mean that unkindly. Really, there are quite a few badly made unconventional and/or illogical games of this kind, but the team behind Bagdad managed to pull it off with flying colours. Of course, it helps that the game uses Chris Hinsley's often utilised game engine used for Pyjamarama and other games of its kind, but there's somehow more logic behind the puzzles in Sceptre of Bagdad, and the subject matter gives its own particular charm to the game - visibly inspired by the Iznogoud comics. I got in touch with the game's designer, Ilja Summala, and he told me the development team were no older than 18 at the time of release, so I'd say Sceptre of Bagdad was quite an achievement for all involved. While there are more classic examples of the genre, Sceptre of Bagdad is a game I would be more likely to recommend to any newcomer of the genre. Interestingly, in both cases, the original version loads slower than the conversion, although the 2008 C64 release of Sceptre of Baghdad is slower due to an intro sequence that loads up before the game starts loading. If you're a collector, you might be interested to know that the Spectrum version of Sanxion was also at least advertised to have a disk release, but an image file of it is currently unavailable, so it's doubtful the disk release ever saw the light of day, or it might have had a very limited print. Anyway, both official versions of Sanxion should be available on both tape and disk. Sceptre of Bagdad, however, was originally released only on tape, whereas the Psytronik C64 release found its way to both tape and disk. TOP ROW - Loading screens from Sanxion, left to right: Commodore 64, ZX Spectrum, Commodore Plus/4 (demo). BOTTOM ROW - Loading screens from Sceptre of Bagdad, left to right: ZX Spectrum, Commodore 64. 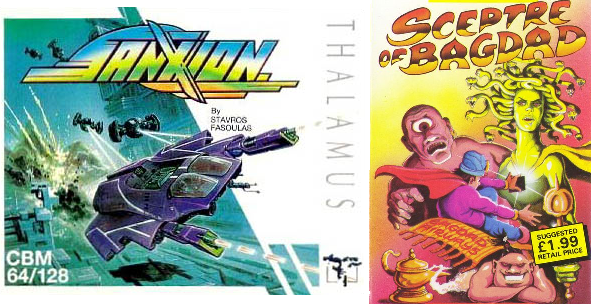 SANXION's loading screen is based on the cover art in both cases, but that makes the C64 version so special is the superb loading tune commonly known as "Thalamusik" by Rob Hubbard - you will happily wait for another 17 seconds for the game to load with a nice tune playing meanwhile. The differences in the loading screen itself are fairly obvious, if unimportant: the black areas in the SPECTRUM loader makes it look like the pictures within the black areas are paper cut-outs, but it works just about as well as the original screen by Mat Sneap. Oh, and the Thalamus logo in the upper right corner is flashing for the duration of the loading. The PLUS/4 screen comes from a separate Sanxion demo by Mucsi of Muffbusters - the actual game release has no loading screen, unless you count some sort of a crack introesque starting screen as one. BAGDAD's original version has a nicely Montyesque (Mole, not Python) loading screen, with credits shown at the bottom. The C64 loading screen only appears in the 2008 re-release, and it's actually based on the original Atlantis release cover art, featuring the obligatory text bits which don't look particularly stylized. I'm not sure this screen gives a very good first impression, but I think it's a nice attempt at honouring the original cover art. (Worth noting: the cover art was redrawn for the C64 release by Alf Yngve, and coloured by Jon Wells.) Also, the 2008 release features a very nice loading tune not available elsewhere in the game, nor apparently in the original 1993 release. This is going to be short, since Sanxion is a fairly simple game to play. You have no special weapons, and the only trick you need to focus on is your enemies arriving from both ends of the endlessly scrolling field - different enemies in different speeds. The basic aim is to score as much points as possible, which can be gathered by destroying your enemies as quickly as possible, so you can get some bonus at the end of each level. These rules apply for all three versions. You can move freely around the given area, which is limited to about a third of the screen's right edge on the SPECTRUM and to about half-way across the screen on the C64. Although this might seem a bit odd, the reason for the movement limitation is only logical - you can't really put much of effort into avoiding enemy contact, and the further back of the screen you are, the more chance you have of shooting them and not colliding with them and crashing. The C64 version, as I have mentioned, features adjustable rate autoscroll, which means the further ahead you go with your fighter plane, the higher your velocity. This element is not featured in the SPECTRUM version - you only get solid speed scrolling, so the bigger area of movement is sort of justified. The SPECTRUM version is also missing gravity, which is an ever-present element in the C64 version. In contrast, you get less room for error when avoiding contact with the enemy on the SPECTRUM. The unofficial PLUS/4 version has the adjustable rate autoscroll, and the movement area is similarly small compared to the C64 original, but that's pretty much where the similarities end: you can crash into anything visible, the controls are horridly fast and have no inertia, the enemies have no proper formations or anything resembling finesse. Also, the PLUS/4 version doesn't have a top-view screen, but then you wouldn't really need one there. The levels are of a similar length in all three versions, but I can't say with any certainty, how similar. In the SPECTRUM version, you get an end-level boss fight at the end of each level; the C64 version features a bonus round in which you shoot or collect bonus items between every regular level; and the PLUS/4 version's speciality seems to be a set of buildings at both ends of each level. The C64 version practically ends on level 10, featuring a full level's length boss fight against a number of massive boomerang-like motherships blasting out missiles and other projectiles; however, the game loops from the beginning until you die or switch it off from boredom, whichever comes first. The SPECTRUM version practically ends on level 5, featuring a huge final fight against all the end-level bosses you've encountered in the game so far, and then you repeat all the five levels again - the game properly ends after finishing level 10. The PLUS/4 version apparently loops through the levels indefinitely, but I have no idea how many levels are there in it. To be honest, I lost patience with it due to having to start a level from the beginning each time I died, no matter how far I had gotten, unlike in the two official versions, which lets you continue from the most recent enemy pattern or bit of terrain you were flying over. If there's one thing that defines Sanxion, it is the requirement to memorize all the enemy patterns. You really cannot make much progress in the game without memorizing every enemy fleet formation and your required positionings for the safest route to victory. An auto-fire feature is definitely a big help to keep your joystick's fire button in a relatively good condition, although the SPECTRUM remix gives you a weapon upgrade, which is nothing more than an in-game auto-fire feature. The PLUS/4 version doesn't give you as much trouble with the enemy patterns, so an auto-fire isn't needed, nor is memorizing fleet formations and all that. Basically, the only gameplay-related thing that makes the PLUS/4 Sanxion related to the original is the adjustable rate autoscroll, which isn't even particularly well made. There's still the main menu I haven't touched upon yet. Yes, there is one even on the C64 version, although you cannot see it until you actually activate and alter one of its items: F1 for number of players, F3 for keyboard/joystick controls and F5 for toggling music in the title screen. In the SPECTRUM version, the menu takes half of the title screen, and only features four different control options and one for starting the game. The PLUS/4 version doesn't have one. Both official versions of Sanxion have their own specific pros and cons. While the SPECTRUM remix has a more traditionally structured progression of a shooter, and more end-level bosses and other interesting enemies, it doesn't have the finesse and complexity of the original in enemy behaviour, nor does it have the adjustable rate autoscroll, which is really what made Sanxion so clearly stick out from all the other shooters of its time. If I were to pick a favourite, or even determine which game was actually better on technical terms, I guess the C64 version would win, but only barely. 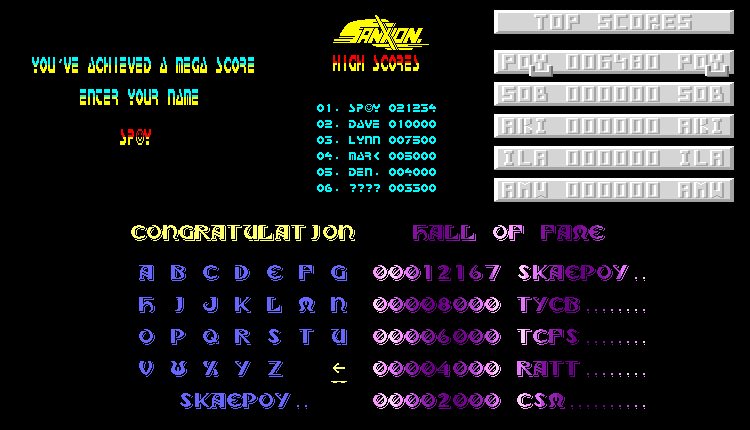 The main focus in the two official Sanxion's graphics is really in the backgrounds, and more to the point, their scrolling. But as with most other games, you have to start with a title screen, which in this case gives nothing away of what's to come. Title screens, left to right: Commodore 64 (with options), ZX Spectrum 48k, ZX Spectrum 128k, Commodore Plus/4. In the C64 version, you get a very no-nonsense title screen, albeit a fairly stylised one. It's nothing but the absolutely necessary information: the publisher, the game title in big rectangular letters and the game designer, all using a light 3D style and boxing. It's so primal, it almost hurts, and I guess that's what they were aiming for - a no-nonsense beginning for a new high-profile publishing company and their new star game designer. For the SPECTRUM remix, a more obviously traditional Spectrum approach was taken. The game title logo is the same as in the loading screen and the cover art, only completely in yellow. In addition to that, you get the obligatory control menu and the credits in a retro-futuristic font, the name of which escapes me at the moment. There are two things separating the 48k and 128k versions: the inclusion of an animated starry background and a text scroller at the bottom in the 128k version. The unofficial PLUS/4 version doesn't really offer much else than a pseudo-celtic font and eight shades of purple, which keep on scrolling through the whole lot of text slabbed onto the title screen. Sure, the colouring effect looks nice, but since the game title hasn't been separated in any particular manner, the effect and font somehow go to waste due to overexposure. Each version has their own style and structure for the game, so we shall look at each version separately. The original C64 version has the biggest quantity of graphics, easily. Although you can only see very little of the ground level in the side camera, the top-down camera shows a surprising amount of detail, which works well together with the side camera - at least most of the time. The real trick here is, that the top-down camera shows more to the back and front than the side camera does, so naturally, it has to scroll a bit faster as well. Add parallax scrolling ground elements and the adjustable rate autoscroll to that, as well as a huge amount of different enemies with their movement patterns and colourings, and you get an overall visually very impressive game. That said, I have to admit that when I was younger, I was never particularly awed of the graphics because of the game's difficulty and the strange choice of a theme song, which we will get into a bit later. Nevertheless, the C64 Sanxion is a very impressive game, particularly in graphics. Also, the original is the only version that has clear references to Finland in its landscapes, so if I were to give any extra points for that, I would. 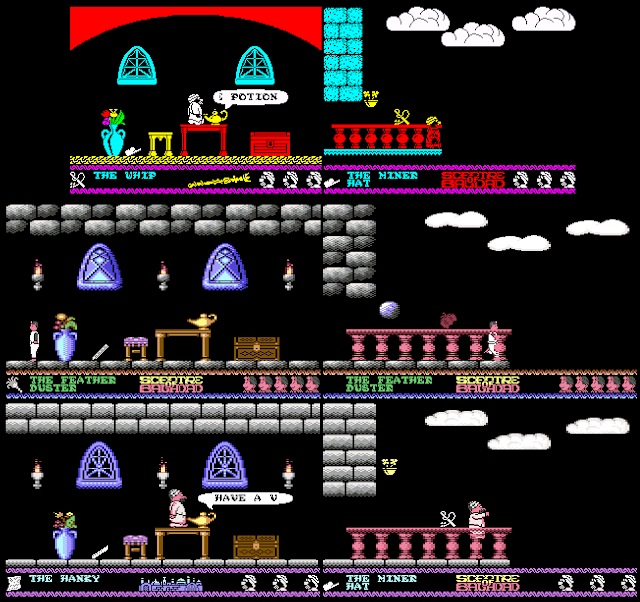 In-game screenshots from the ZX Spectrum version. The action screen area in the SPECTRUM remix is quite small compared to the original, and feels a bit claustrophobic. The relatively small size can be explained by having the sides blacked out to hide the scrolling proceedings, but the area of movement becomes very narrow in certain points of the game due to the screen only accommodating five sprites in a vertical line with no overlaps - the C64 version utilises the given space more creatively. While the screen size will certainly become an issue in the later levels, it's not as bad as having boring backgrounds. All five levels are practically monochrome with black and two shades of cyan used throughout the game, and of the five backgrounds used in the game, three consist mostly of squares of different kinds. It's as if the graphician experienced an artist's block in the middle of his progress and just went with the first thing that came to his mind when drawing the background graphics. Only the info panel in the middle offers more colours into the mix, but it could have been smaller vertically to make more use of the screen for the action. At least the use of shading is nice, and as mere works of graphic art, the first three levels are nice to look at, albeit repetitive. Unfortunately, being monochrome as they are, the background graphics often interfere with enemy projectiles, so it's difficult to keep track of what's happening occasionally. In-game screenshots from the Commodore Plus/4 version. If the SPECTRUM graphics looked colourless to you, perhaps you should take another look. While the unofficial PLUS/4 version uses more colours, the extra is only marginal, and every single level seems to use the same colours: green for the ground level stuff and your ship, grey hi-res enemy sprites, and just basic light blue sky in the background. There is no top-down perspective camera, so any parallax scrolling is gone. The enemies only have two movement patterns: standing still and hovering up and down. Even all that cheapness doesn't compare to the huge amount of glitches and bugs that the game throws at you every few seconds - looping explosions that get in your way, sudden stripes of green in enemy vessels and sometimes invisible obstacles that appear only when you hit them. If it weren't for these problems, the PLUS/4 Sanxion experience wouldn't be truly horrendous. It's not a particularly bad-looking version, just nothing close to the official versions. "Get Ready" and "Game Over" messages, left to right: Commodore 64, ZX Spectrum, Commodore Plus/4. My favourite thing about the SPECTRUM remix is the "Get Ready" message, which says "Prepare for death" instead. It shows that the conversion team was aware that this game was ridiculously hard and made either fun of it, or made fun of the poor gamers who thought they'd be having a good time after purchasing the Spectrum version. Too bad the "Game Over" message wasn't nearly as unexpected. Both COMMODORE versions took the traditional approach to these matters, but both of them have their own specific quirks. The C64 version shows the "Get Ready" text on a black screen first, but continues to stay in view for a few seconds after the game has started; however, the "Game Over" screen is only displayed on an empty scrolling landscape where you died. The PLUS/4 version launches into the game with the "Get Ready" text displayed on a black screen, but every time after you die, the text is shown on a similar background as yousee in the "Game Over" screen. Entering your name for the high score lists, and the high score lists. Top left and middle: ZX Spectrum. Top right: Commodore 64. Bottom row: Commodore Plus/4. Finally, entering your name on the high score table looks very different on all three versions. The C64 version puts you straight into the high score table, in which you can enter your three initials by using your chosen controller to move the cursor and choose the letters. The SPECTRUM version uses a similar concept, but on a separate screen with only text on it, and you don't have the luxury of having a cursor to see which letter you are on. The high score table itself is a long scroller, which can fit 99 names on it. The PLUS/4 version takes after the original, and features only six entries on the table, but this time the name writing system is a grid of letters, in which you move the highlight with your joystick. Apart from a few new colours, there are no new graphics as such. With such drastic differences in all aspects, I guess the results are obvious to anyone that cares to use their eyes properly. However, the differences in the two SPECTRUM versions are so little, that I might as well put them in the same spot. To some of us, Rob Hubbard's award-winning "Thalamusik" written for the C64 version's loader was the most awesome part of the whole experience. To others, the only tune they ever might have had the chance to hear was the much more dramatic title screen tune, which I have to say is a strange choice. Hubbard was made to SIDify "Dance of the Knights" (a.k.a. the "Montagues and Capulets" theme) from Sergey Prokofiev's ballet "Romeo and Juliet", which gives the game a very heavy initial feel. Perhaps unnecessarily so. Although the tune itself is one of the most famous and impressive classical themes of its time, and the C64 arrangement of it is brilliantly done, I never thought it really fit the game's overall style. Happily, you can turn off the music if you dislike it enough, and it will not affect the in-game sound effects. For that, you will need to mute the TV. Perhaps that is why Thalamusik was used as the main theme tune in the 128k SPECTRUM version, rearranged for the AY-chip by Wally Beben. I have to say, it works much better in the context. The Prokofiev tune was moved be played during the showing of the high score table. It all just feels more natural this way, but the AY-soundtrack just doesn't sound quite as good. The 48k SPECTRUM version doesn't give sound credits to anyone, so I'm guessing Dave Thompson either did it all himself, or it's Wally Beben again without his name being mentioned. Basically, it's just a beeper version of the 128k soundtrack. The sound effects are actually more interesting. On the C64, you get a nicely muffled droning noise of your vessel, which alters pitch and opens up in a very unique way, as you accelerate and decelerate. Additionally, you get two different explosion effects (one for the enemies, one for yourself), a weird alterating "gwump"-sound for your weapon, a low thump for shooting something that cannot be destroyed, slightly muffled repeating bell-like sound for counting bonuses, another weird hit sound for hitting those weird metallic worms, a quick "woop-woop" sound for entering a different sort of a zone, another strange warbly sound for gaining an extra life, a high ringing "ding" sound for picking up those coin-like bonus items... and so forth. SPECTRUM's set of sound effects is lesser in both quantity and quality. Basically, it's all different kinds of white noise-like noises, if you're playing the 128k version, or pips of different pitches if you're playing the 48k version. Firing your weapon produces a short tapping noise and any explosion causes a long noise. The only sound effect that differs from this is when you reach the end of a level, and your bonuses are being counted - this produces a loop of ascending blurpy beep. Still, due to the better use of tunes on the 128k SPECTRUM, I'm letting it share the high spot with the original. Similarly to the original, the unofficial PLUS/4 version only features the Prokofiev tune, but here, you can hear some false notes playing at inconvenient spots, making the only tune in the game a bit of a mess. There are also only three sound effects: your pitch-alternating plane noise, an explosion noise when you crash, and a long phasing low-pitched single-note beep that has been qualified as the bonus counter sound. There is no other way to put it: Stavros Fasoulas did a fantastic job at creating something new and exciting for the genre at a crucial time, and helped a new publishing company to straight success. I might be exaggerating this a bit, but without Stavros's three hit games for Thalamus, their story wouldn't necessarily be that great a success, and any Finnish gamer should be proud that a fellow countryman of theirs was partly responsible for allowing classics like CREATURES, Armalyte and Hawkeye to be released by this legendary publishing company. On another quarter, Jukka Tapanimäki's commercial career as a game developer started by copying ideas from Sanxion to his Octapolis, so Stavros's influence was surprisingly great, when you really think about it. As for my recommendations regarding the two official versions of Sanxion... let's put it this way: the C64 version is a strong cup of coffee, but the SPECTRUM remix is a strong cup of tea. I'm more into coffee. Just as a reminder, I learned from Ilja Summala, that the game engine was taken from Pyjamarama, but it's obvious that it was slightly modified. Still, Sceptre of Bagdad is an arcade adventure, which means that there are platforming elements by which you travel from area to another, and you need to carry and use certain objects in certain places to solve puzzles. The main difference to Pyjamarama is, that you can only see one item at a time from your inventory of two hands, which is a bit frustrating to be honest. In the C64 version, your inventory has been expanded to hold four items, but you still only see one item at a time. There are only 45 screens in the game, so it shouldn't prove too large a project for any adventurer, but as always, it's the getting started which takes the biggest chunk of time - getting to know the area and what sorts of items there are to help you on your way. The menu in the title screen consists of the usual control options, in which the "Redefine keys" option really points out the necessity of playing the game on keyboard. You can move your man left and right, but his jumping has been dealt with differently in both versions: in the SPECTRUM version, you can only jump forward, while the C64 version allows you to jump straight up or forwards. Another key makes you enter another room through a doorway, and another key is assigned for swapping the shown item from your inventory, which effectively will change the item on the ground to the one in your shown hand. The other options in the title menu are "Start old game" and "Start new game", the latter of which is obvious, but the former lets you continue the game from a checkpoint, which you need to collect in the game - it looks like a vase of sorts. The C64 version doesn't have as many control options, but you get three possible sound setups instead - "music/sfx off", "music" and "sound/fx", which are pretty obvious. Once you get into the game, the first obvious difference you will notice is that the SPECTRUM version gives you only 3 lives to start with, while the C64 remake gives you two more. If you're using a 128k SPECTRUM to play, you will notice that you take no damage or lose lives from colliding with enemies, but there are some puzzles that cannot be solved due to the way the RAM works differently in 48k and 128k Spectrum computers, i.e. the spider that you need to feed a fly to doesn't exist in the 128k version. The next difference you will come across is, how to get the genie in the lamp to speak - in the original, you just walk to it, and a speech bubble will appear, while in the C64 remake, you need to have the handkerchief (hankie) in your visible inventory. So, this already shows that the C64 version has definitely been altered a generous amount. But how much, exactly? Well, one major difference is, that you can actually shoot projectiles in the C64 version. This takes down the difficulty level seriously, as you can only avoid getting hit in the SPECTRUM version. Then again, the flying enemies in the C64 version act very differently from those in the SPECTRUM original. A lesser adjustment to the game mechanics in the C64 version is that you actually need to activate the item you are standing next to in order to pick it up - you just can't walk into them. While this reduces the amount of hassle for the occasions when you didn't want to swap items, it also adds to the amount of things you need to concentrate on, so it's a balanced change. There are also some items in the C64 remake that didn't exist in the original Spectrum game, and vice versa, so if you're planning on completing the game using a walkthrough, the same walkthrough as for the Spectrum original doesn't completely apply, but with some logical thinking, it's not that different overall. The "Uncut" C64 version from 1996, however, is more similar to the original game, with only some differences in controls - the original items are back, the original puzzles are back, the original inventory size is back, you only have three lives and you don't get to shoot enemies anymore. First off, I have to say that there has not been, nor will there ever possibly be, another game comparison that features so many practically unnecessary graphic mode options for one of the versions, as there are in the two C64 versions of Sceptre of Baghdad combined. For that reason alone, I suppose, I would have to give the C64 Sceptre the higher spot, but let's go through the necessary details first. So, here are the C64 graphic mode selection screens for the 1993 remake and the 1996 Uncut version. The 1993 version allows you to choose between more fitting modes for both the original breadbox C64 and the newer slimcased C64C, which apparently have some differences in how the VIC-II graphic chip works. I'm not sure about the details here, since I only have a C64C model at my disposal, but I couldn't notice any real differences between the two versions on my C64C, nor did I notice any real changes when switching between a C64 and C64C on the VICE emulator and trying out both graphic modes. The 1996 Uncut version has significantly differing graphics to start with, and it also allows you to choose between four materially different graphic modes. Most of the background graphics have been redrawn and our protagonist now looks more like he looks in the original SPECTRUM version, only more colourful. The graphic modes allow you to use either hi-res monochrome sprites or multicolour wide pixel sprites for the enemies, and take either of the two background colour modes introduced in the 1993 version. Title screens, left to right: ZX Spectrum, Commodore 64 original, Commodore 64 Uncut. All the title menus feature a similar game title logo, although the SPECTRUM version uses an alternative spelling of Baghdad (one us Finnish folks use, for example) and all the graphics are very much still and lacking in colour compared to both C64 title screens. In the C64 versions, you get a colourful animated display of some small pieces of paper (or something) flying around the two pictures of our protagonist, a greyscale colour scroller through the menu items, blinking numerics for the chosen options, different colouring for the game title logos for both versions (blue-to-red in the 1993 version, gold-shaded in the 1996 Uncut version) and three lines of credits, the bottom of which is a scroller. The one thing I'm not happy about in either of the C64 versions is that Jon Wells has taken all the credit for game design - no mention of the Spectrum original at any point in the scroller. Yes, he might have rewritten the entire game from scratch for the C64, but the original design was definitely from Productive Playtime. The first two in-game screens, top to bottom: ZX Spectrum, Commodore 64 original, Commodore 64 Uncut. The original game's graphical content starts off promisingly, and doesn't disappoint at any point, although with the SPECTRUM's graphical capabilities, you know what to expect - attribute clash, and lots of it. In this game, however, it doesn't really prove to be much of a problem, but it does put the SPECTRUM at a great disadvantage against the two C64 versions, both of which use a dual-layer sprite for the protagonist (hi-res monochrome frame with multi-colour colour fill), and colour clash is never seen. In any case, the original content is very impressive, considering the game was basically built on the Pyjamarama engine: only a very few elements really resemble or have been copied straight from Pyjamarama, and most of them you wouldn't probably even recognize as such. For a teenage hobby project, getting the game to look so good and fitting for the subject matter is a massive feat indeed. With 5 years between the original SPECTRUM version and the C64 remake, it shouldn't be much of a wonder to anyone, that the C64 version is not only more colourful, but also more detailed, animated and carefully designed in graphics. The first two screens are not perhaps the best examples of this, but we shall get to all that soon enough. The info panel alone is worth writing a part of a paragraph about. See, the basic design for the info panel is similar in all three versions; the Uncut 1996 C64 version even shares most of the colouring and styling of the original SPECTRUM version. Only the 1993 C64 release uses much more colour for the squiggly frames and the five energy meter heads. All versions alter the middle part occasionally - you get the game title there in a few different colours, the wand which will hold the sceptre in the end, as well as a picture of your castle. Example of a room with flying enemies. Top left: ZX Spectrum. Top right: Commodore 64 original. Bottom row: examples of three graphic modes in the Commodore 64 Uncut version. Because the changes between the four graphic modes in the 1996 Uncut version are so limited, I'm only going to do this comparison for one screen. For some extra neatness, this screen, situated immediately left to the starting room, allows me to compare the 1993 C64 remake's enemies to those in the original SPECTRUM version and the UNCUT C64 version. In simple terms, the SPECTRUM and UNCUT C64 versions use the same enemy formations and movement patterns, which is basically just either horizontal or vertical movement. The 1993 C64 remake has a new feature called Demon Raid, in which a small number of enemy sprites (which, as you see, look very different from the other versions) move around in various different non-linear patterns. Only in Demon Raid rooms, you are allowed to use your projectile weapon, which curiously looks like a shuriken. I couldn't bother to get a good picture of it - after about 5 attempts, I noticed the chosen room wouldn't allow that amount of action comfortably organized so it would look good in a screenshot. As for the two more similar versions, the SPECTRUM version displays some colour clash, which is only to be expected, while the C64 version doesn't - in any graphic mode. I have to admit, somehow the monochrome hi-res sprites work better in these sorts of games than wider-pixeled multi-colour sprites, at least when it comes to the linearly moving enemies. The background colour options only make some seemingly inconsequential colour changes; as you can see here, the doorway curtains are red in the second option. Perhaps the effect of such a change is more useful when playing on a real C64 or C64C. The "Air Baghdad" section, top to bottom: Commodore 64 Uncut, Commodore 64 original, ZX Spectrum. Commodore 64 original: the "puzzle solved" effect. Here might be another example of how the shading and detailing is easier to deal with on the C64, but the seeming lack of effort on the SPECTRUM here shows a good way to deal with too much attribute clash related problems. Both versions work fine as they are in this regard. The C64 version's carpet flying animation is a bit too wholesome and of long duration for my taste, and the SPECTRUM carpet looks more like it should. Because the above paragraph was so short, I shall take this opportunity to mention a visual effect that only the 1993 C64 version has: when you have solved a puzzle, you will see a flash of light in the info panel for a short time. Think of it as an old-school "Achievement got!" type acknowledgement. More adjacent rooms: the oyster room and the entrance to the hidden treasure room. Top left: ZX Spectrum. Top right: Commodore 64 Uncut. Bottom: Commodore 64 original. Although I chose these two screens to show some weird design choices and changes, such as the non-animated waterfall in the SPECTRUM compared to the animated one in both C64 versions, the weird extra step and the extra shark fin on the C64 and the completely remade entrance to the treasure room in the 1993 version, I noticed something even more interesting that I hadn't noticed before. The 1993 version is the only one that shows animated arrows above any entryway. Even more interestingly, the 1993 version's protagonist actually looks a bit funny, anatomically speaking. His arms are only waist-long, which I'm guessing is due to the limited sprite width. For the original protagonist and his UNCUT C64 equivalent, his arms aren't that much longer, but his more cartoony appearance (long nose, short legs, ridiculous mustache) allows for some anatomical incorrectness. In any case, the original caliph-to-be has much more charisma than the regular-looking bloke in the 1993 C64 version. The bull and the cart puzzle room. Left to right: ZX Spectrum, Commodore 64 original, Commodore 64 Uncut. One of the most important rooms in the game is the one with the bull - it features the axle you need to repair a bridge with. Although it's not necessary, I've always thought it a nice gesture to give players of these sorts of games a little pointer towards the items in the room available for you to pick up. In the SPECTRUM version of the bull room, the axle is kind of hidden from plain sight, since it's coloured the same as the whole bull-and-carriage combo. If you didn't know the purpose of this room, you might easily go back not noticing the idea here, particularly as you can only get the axle by swapping it with a certain other item (not included in these screenshots). At least you see the axle clearly as a puzzle object in both C64 versions. That said, the whole bull-and-carriage combo looks kind of awkward in both C64 versions due to the wider pixels and not the best use of shading. But I'm not completely happy with the red monochrome bull-and-carriage combo, either. The wizard's cave, left to right: ZX Spectrum, Commodore 64 original, Commodore 64 Uncut. Another very important room you only need to visit once if you're playing with a walkthrough, is the unnamed wizard's cave, but he looks more like a Merlin or a Maghreb than Gandalf to me. The differences in animations are quite notable: the SPECTRUM wizard only stands there and harmful steam arises from the two cauldrons beside him, while the C64 wizard has lightnings coming from his hands. There are also torches on the C64 cave wall, which adds even more animation to the room. Medusa and Cyclops, left to right: ZX Spectrum, Commodore 64 original, Commodore 64 Uncut. Now we're getting towards the end of the game - you need to get past these two giant monsters before you're able to get to the final puzzle. Something about these two rooms doesn't quite work for me in any version. Perhaps it's because there's so very little decorations; perhaps it's because the two giant enemies don't do anything else but speak and stand (or sit) in your way; perhaps it's because no version really gets the look of these legendary creatures quite right. Or perhaps it's all of the above combined. Of course, as an arcade-adventure, this is a puzzle game at heart, and there's only so much you can do with the original game engine. The available memory might have had something to do with the look of these things as well. But if there's something positive to be said about the two giant monsters in the original SPECTRUM version, it's that they actually look more threatening than those in either C64 version. More particularly, the Cyclops' room with the piles of human bones, as opposed to the weirdly formed non-human bones on the C64. The overall colouring is much more thematically correct on the C64, and as before, the two versions only have slight adjustments to the background graphics. The "Game Over" screen isn't much to look at on the C64, but the SPECTRUM original at least features a unique animation bit of your character walking from left to right and transforming into a skeleton while at it, and finally crumbling down on the ground before he gets to the other end of the screen. I wonder why Jon Wells didn't bother to copy this for either of his C64 remakes. Now, I don't want to spoil the endings for everyone, but if you know of Jon Wells' C64 work, you will be aware that he has never done anything half-hearted, particularly regarding endings. Unfortunately for those of you who would rather get to the ending fair and square, the C64 version has the proper ending only as a separately loadable program in the disk version, so anyone with access to the said disk image can easily see the ending with no effort. If you're playing from the Psytronik tape, however, it's the last section of a multi-load scheme. Compared to the very much enhanced C64 ending, I'm afraid the original SPECTRUM release falls far behind, but at least it has a picture for an ending, which is certainly better than just a bunch of text congratulating you. Time hasn't been kind on the original SPECTRUM game's graphics, I'm afraid. But for what it represents, I still think it's a remarkable feat overall, to get such a great atmosphere, and ultimately very fitting visuals with the limited knowledge at the time. Jon Wells certainly improved the graphics in every essential manner, but then he had many years of practice and a deeper understanding of the C64 architecture before deciding to improve upon an old Spectrum game. Both the C64 versions offer something the other doesn't, so I shall call it a tie for them. In a way, it is a great pity, that there was no 128k Spectrum version of the original game, because the 48k version features no music at all, and all the sound effects are just bulky Spectrum bips, taps, blurps and other onomatopoetically describable noises. Of course, the team responsible for the original game didn't have a separate sound designer, so I guess they went with just enough sound not to be boring, and this way, Sceptre of Bagdad has the sort of feel to it that you get from playing old 16k Spectrum games like Jet Pac. However, a good thematically fitting soundtrack is more entertaining, not to mention more technically impressive. Both the C64 versions feature a slightly differing soundtrack - the 1993 version has more music, as the short "Start new/old game" ditty has been left out from the UNCUT version. So, there's at least three tunes in both games, in addition to the aforementioned short ditty: the main theme tune, the in-game tune and what's basically an ending tune of sorts, which starts playing the moment you grab the Sceptre. It's all very nice and hummable, which makes for a more fulfilling experience. In addition to the tunes, you have the option to listen to sound effects only, or no sounds at all. There are quite a lot of sound effects in both C64 versions, all of which are quite impressive. For example, when you come into a room that has water in it, you will hear some wavy noises by default, and nice splashing as you walk in the water; outside the castle, you hear plenty of surprisingly realistic wildlife noises, etcetera. You even get a funny "argh" type of a synthetic yell for the singular Game Over sound. Most of the sound effects and even instruments in the tunes use various different filters, so they will all sound fairly different on all revisions of the 6581 and 8580 SID chips. My suggestion for the best possible sonic experience of Sceptre of Baghdad on the C64 is to use an emulator such as VICE, where you can specify the emulated SID chip, and see which version you like the best. Overall, I think the scores here will not require further explanation. Being most likely the only Finnish-made Spectrum game to have an international release during the machine's commercial lifespan, it's not a bad one. At the time of original release, it might have been a bit outdated, seeing as it didn't particularly improve much upon the Pyjamarama game engine, but as a hobby project for three teenaged blokes, it did well enough. I was told by Ilja Summala, that two out of the three team members work in some sort of IT business, and the one who did the graphics for the game is now an architect - how's that for logical progression! Anyway, while the game engine was getting old at the time, it still worked well enough to inspire another game for it, and Sceptre of Bagdad is still able to prove there's nothing really wrong with it. Still, it's only natural that a completely reprogrammed, redrawn and rescored version - with proper effort taken - would be superior to the original, however more outdated the game engine would be in 1993 and further on. This is just how it goes. Despite the mathematically ungenerous and unforgiving scoring here, I'm more comfortable playing the Spectrum original because it has the correct feel to it, that belongs in these types of games. For whatever reason, the 48k ZX Spectrum just happens to be the correct machine to play these games on. That said, the C64 remakes are technically miles and years ahead of the original, and they do offer a very good alternative. For a final word, I have to say I'm a bit sorry that Productive Playtime never made anything else apart from Sceptre of Bagdad, but for the historic value it offers in so many ways, it's plenty enough. That's it for today, hope you enjoyed it! Next time, I'll be doing another comparison of another Finnish game, because I couldn't find any suitable Christmas-related title to write about that I hadn't written about already. Until then, have a good shopping season! “The development team were no older than 18 at the time of release”. They were kids? That would explain things! I couldn't figure out why some woman was telling the Sultan that he couldn't go to bed until he finished cleaning the palace! And, while most of the puzzles made sense, that one definitely did not. I spent a lot of time cleaning the palace with the Whisk and rubbing the Hankie on the Lamp until it said it was "C L E A N". It was only through trial and error that I figured out that I needed to be carrying a certain object when I visited her; an object that had nothing to do with cleaning! Maybe it was a translation problem, but I still don't get how that item was supposed to make her go away.